In 2018, South Coast Winery Resort & Spa has made a commitment to focus our efforts on the Boys & Girls Club of Southwest County. Through the efforts of the entire South Coast Winery Resort & Spa Team, we hope to make a lasting impression in our community. 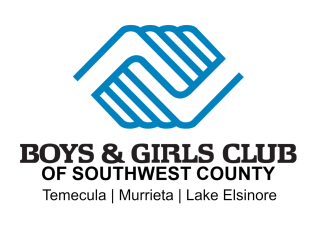 The Boys & Girls Club of Southwest County provides academic support, sports, arts, S.T.E.M., career readiness, and leadership programs through before and after-school programs and day camps at its three site locations in Temecula, Murrieta, and Lake Elsinore. The mission of the Boys & Girls Club of Southwest County is to inspire and enable all young people to realize their full potential as educated, responsible, caring, and productive citizens. Every day before and after school, Boys & Girls Club of Southwest County delivers the nationally tested and time proven Formula for Impact, a recipe that has ensured thousands of youth in Temecula, Murrieta, and Lake Elsinore have had the opportunity to fully realize their greatest potential. The Boys & Girls Club of Southwest County was recently awarded 2017 Emerald Charitable Organization of the Year by the Temecula Valley Chamber of Commerce. To learn more about the Boys & Girls Club of Southwest County, visit their Facebook Page, or go to their website at www.bgcswc.org. For partnership opportunities, or to schedule a Club Tour, please contact Resource Development & Marketing Coordinator, Alina Cota, at alinac@bgcswc.org. Only California-based 501(c)(3) nonprofit organizations will be considered. All corporate charitable contributions, sponsorships, and in-kind services will promote our business goals, create positive visibility and demonstrate social responsibility. Contributions will be coordinated with employee volunteer activities when possible to achieve maximum impact within budget guidelines. We will consider requests to support social, community, civic, educational and economic endeavors if these support corporate business goals and meet contribution guidelines and/or if the organization’s staff is involved in the governance of the organization. Requests from organizations that discriminate on the basis of race, color, creed, gender or national origin will not be considered. Requests from religious organizations will not be considered; however, a community program sponsored by a religious organization will be considered (e.g. food pantry). Requests that solicit financial support for individuals, political candidates and political campaigns or entities that are not 501(c)(3) nonprofit organizations will not be considered. All organizations requesting assistance can complete a special application available at South Coast Winery's resort. Each request must be made in writing on your organization’s letterhead and be accompanied with a completed copy of the special application. Only those organizations completing and returning the application in its entirety will be considered, on a first-come, first-served basis. It should be noted that South Coast Winery Resort & Spa’s contributions fund does have limitations and each application is reviewed by special committee based on merit and other standard requirements to ensure fair distribution. A minimum of three weeks is required to conduct a preliminary evaluation of your written application. If this preliminary evaluation shows there are sufficient grounds for your request to go before Committee, another five weeks will be required before a decision can be made. Not all applicants will be notified of the outcome of the donations application process.